Forgiveness is a funny thing. It’s easier said than done. We like to think that we are able to easily “forgive and forget.” People will tell you that you shouldn’t forgive if the person you want to forgive does not ask for forgiveness or is not remorseful. In other words, your forgiveness is conditional and dependent upon the person you are trying to forgive. Others will say that you should not forgive someone if an offense is so huge. There is a belief that in these cases, a person does not deserve forgiveness. Forgiveness is also interesting because you can say you forgive, but how do you truly know you have forgiven someone? Are there obvious signs? Subtle signs? Does a flood of peace come over you and do you suddenly feel renewed warmth toward a person? Oftentimes, nothing seems to happen and you assume you have successfully forgiven someone because you believe you have forgiven someone. I will leave it up to you to sort through your definition and understanding of forgiveness and how you want to proceed when you believe you need to forgive someone. I do know this: You can choose whether or not you attach conditions to forgiveness: “I will only forgive if my partner acknowledges he or she made a mistake and asks for forgiveness.” Or, you can give forgiveness freely. This goes against popular advice that forgiveness is contingent upon the other person’s behavior. What if someone is too proud to admit he or she made a mistake? Or, perhaps the offender feels terrible and may want to be forgiven, but his or her communication limitations contribute to an impasse. Will this person ever receive forgiveness? I would like to explore that. In many encounters, a woman might assume her husband does not care because he is not talking about the issue at hand. In the silent space, a lot of assumptions are made and conclusions are drawn. This subtle aspect of interaction can spark a cascade of unfortunate events. Be on guard in making hasty assumptions about silence and words. Instead, look to actions and behave in ways that demonstrate forgiveness and build trust. Tip: Use the following questions as a guide so that you can forgive your partner. If there is nothing to forgive at the moment, save this exercise for a time in your marriage when you need it. If you can, think of an incident that could warrant forgiveness. In his book Creating an Intimate Marriage, author Jim Burns designed the “Process of Forgiveness Sheet.” The following questions are based on his forgiveness process. Think about these questions, write down your responses if you’d like, and do not communicate them with your spouse at this point. 1. Describe what happened to upset you in 1-2 sentences. Does this still bother you? 2. How or why does this bother you? 3. What were your emotions? 4. If an event triggered strong emotions, how did you act? After you’ve answered the first four questions, the next three will help you move toward problem solving and forgiveness. 5. What was your part in the conflict? 6. What do you need to forgive your spouse for? 7. What do you need to forgive yourself for? You may still feel pain and hurt. You don’t have to eliminate the pain and hurt during the forgiveness process. See how tricky and vague forgiveness can be? Emotions tend to be confused and scrambled, and you may feel like an imposter when trying to forgive. On the one hand, you bring to the surface feelings associated with a painful incident, while at the same time, you are trying to experience new, positive feelings. After you’ve formulated responses for all of the questions, you can discuss the issue with your spouse. Remember to keep it brief and try to avoid an argument. State your responses and then let your spouse do the talking. The following example is not brief, but since it is about a fictitious incident that happened a year ago and is about betrayal, the issue has not been resolved for this woman. Hopefully you can come up with a simpler scenario. I offer this in case your issue is complicated. The number in the parentheses correspond with the questions above. (#1) Honey, I’m still having a hard time with the time you had a one-night encounter while you were on a business trip last year. (#2) This still bothers me and I haven’t been able to fully deal with it. I’d like to put this behind us so we can move forward, but I can’t seem to shake it and I’m afraid that this act of betrayal will never be put to rest. (#3) I know we haven’t talked about the incident in over 6 months, but it still lives on inside me. Do you remember that at first I was in a rage? I wanted the woman you slept with dead. I was more angry at that woman than you; I was shocked that you would do such a thing to me and to us, and I felt deeply hurt and violated. I questioned and blamed myself and wondered what I was lacking. I felt unattractive. We’ve worked on our trust during the past year, but mainly, I feel anger continuing to fester and I feel a lack of control. I’m afraid we’ve lost the joy and happiness I once felt and I want it back. I am worried about our future. (#4) When you first told me about the incident, I wanted to know all the details. I was embarrassed, humiliated and wondered how or why you could lead a secret life. Was this the first time? Have you done it before? Will you do it again? My imagination ran wild. I was livid that we made love a few times before you told me. I had no idea that you were carrying this horrible secret. After the initial shock wore off, we went to a doctor to be tested for venereal disease. Even though we have a clean bill of health, I have become distant from you due to trust issues. (#5) I’m sorry that I have not been as loving and relaxed as I once was, but I feel that things have changed between us and because of my resentment, I often act like a “cold fish.” I know you say that I had nothing to do with your decision and mistake, but I still wonder what I could have done differently or how I can act now so that you won’t be interested in other women. (#6) I know I need to forgive you for sleeping with another woman and I know you are truly sorry and have assured me this will never happen again – that you don’t want to lose me or the kids, but I just can’t get past the whole thing. I wish it had never happened. I am more angry at the women in this world who don’t give a darn about married men. My rage is still on other women out there – people who take husbands away from their wives. I guess I need to forgive you for being weak, but I can’t be sure you’ll never be weak again. Of course, there’s a lot more that was said between this fictitious couple, but you can see how the wife tried to keep her answers brief and to the point. In situations involving strong emotions, it might be a good idea to write a script and read it to your spouse when you are ready to bring up the topic for forgiveness. Like I’ve said before, bring up sensitive issues when you are both receptive and able to devote your full attention to the issue. If you feel an argument brewing, discontinue the conversation and come back to it when you are ready to forgive. You may not achieve forgiveness, but if you are moving toward it, that is the goal. You are achieving greater intimacy as you discuss and move toward forgiveness. 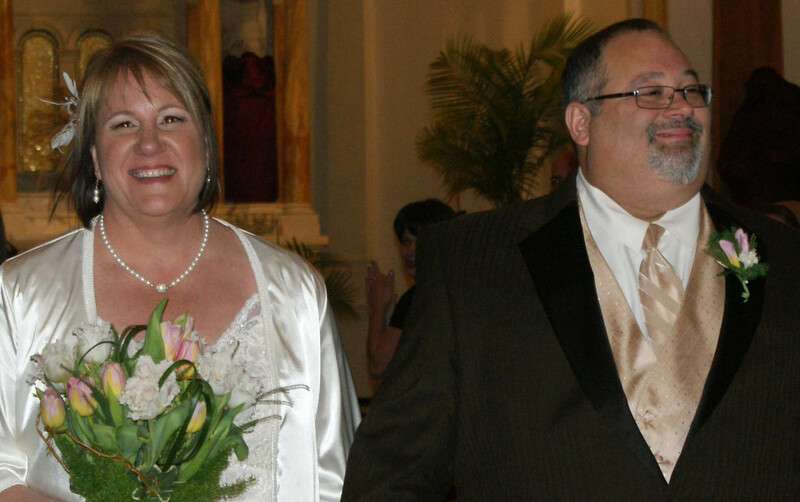 Meet Paul and Amy who were married on March 31, 2012. They formed a special friendship after their first date at a pizza place 2 years ago. Amy was unexpectedly widowed in 1994 with 3 young children, ages 7,5 and 10 months old. She's raised her children as a single parent all these years and is so blessed to have met a wonderful man. This is Paul's first marriage and he feels equally blessed at this time in his life. Paul and Amy serve as a reminder that is important to first work on yourself and your life; to be open to what might come your way and to not rush things. Congratulations Paul and Amy!